I got this idea because my son loves shortbread cookies. I looked up a couple recipes but I wanted to make it simple and slightly healthier. To start, grate 2 cups of Cheddar cheese and 1 cup of butter cubed. Mix together the flour and the butter. Cut up the butter until you get coarse pea sized chunks of butter. 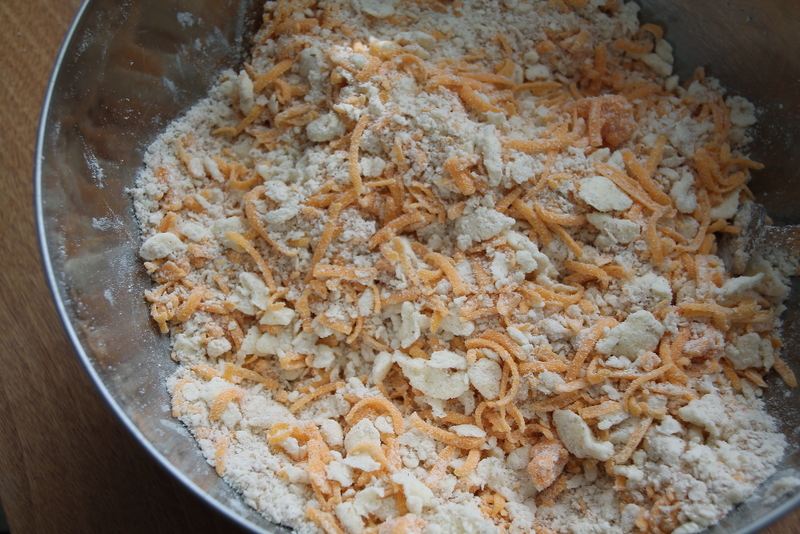 Add the Cheddar cheese to the mixture and mix well. Mix everything together until you get a ball of dough. To keep the cookies flaky, you don’t want to knead the dough too much. Divide the dough into two portions and make two logs. If you want small cookies, divide dough into three or four logs and roll out thinner. I am making mine about a two inch cookie. Wrap each log in parchment paper and place in the fridge. Slice the logs into 1/4-12 inch slices and place on a cookie sheet. The cookies will expand slightly so leave a little space in between the cookies. Bake at 350 Degrees for 15 – 20 minutes. I liked mine baked a little longer since it made the cookie crispier. I think after making these, I would put in more cheese next time but it still was delicious. These would be great for appetizers or with a good bowl of soup. I stored mine the fridge and toasted them lightly before eating them. Mix together the butter and flour. Cut the butter until the flour and butter resembles pea sized pieces. 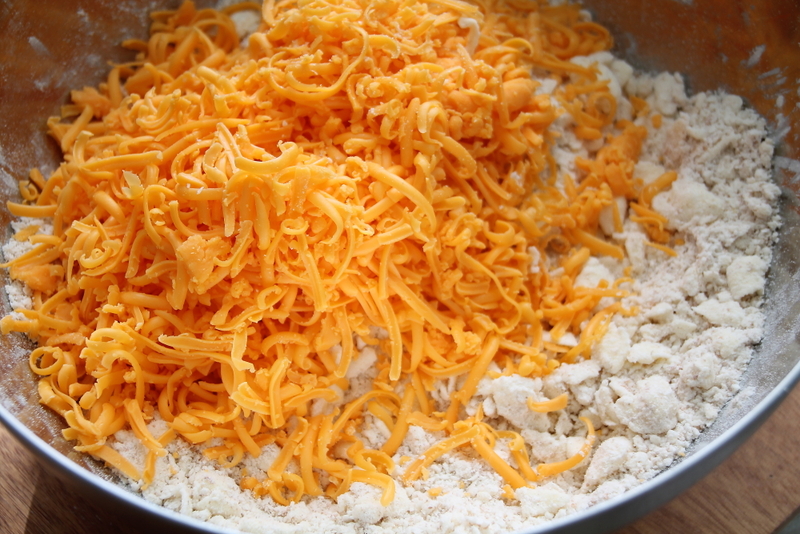 Add in the Cheddar cheese and mix together. Add the milk to the dough. Knead together until the dough is mixed. Don’t over work the dough since you don’t want the dough to be too tough. Divide the dough into two logs. These will result in a larger cookie. If you want smaller cookies, divide into three or four logs and rolls the logs out thinner. Wrap each log in parchment paper and put back into the fridge. Wait at least one hour or overnight. When the cookies are hard, preheat the oven to 350 degrees. Cut the logs into 1/4-1/2 inch slices. Place the cookies onto the tray leaving some space in between the cookies since they expand. Bake cookies for 15-20 min. The longer you bake them, the crispier they will be. Cool cookies on a cooling rack. Store in an air tight container for 2 days. Or store in the fridge and toasted them lightly before eating them.